Bangkok is known as a modern, fast-paced city with deep historic and cultural roots. Still, the exotic city has plenty to offer families with kids—if you know where to look. Here are a few activities that will entertain the kids and bring out everyone’s inner child. 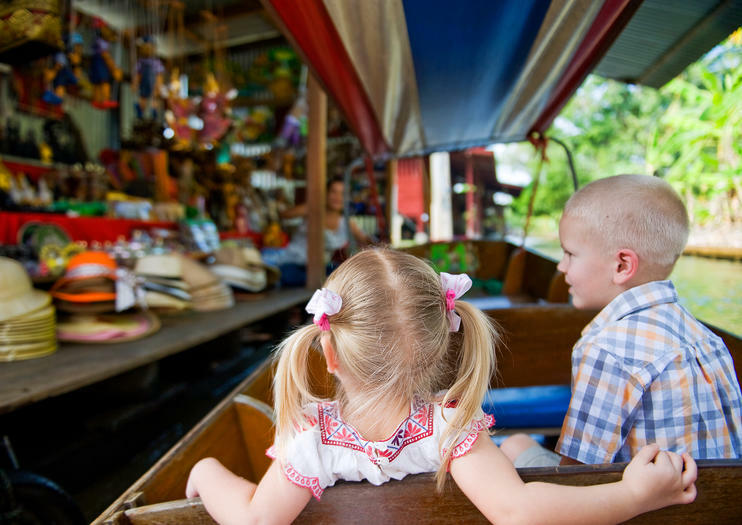 Play a game of “I Spy” in one of the city’s lively floating markets such as Damnoen Saduak, where you can also interact with locals and sample unusual tropical fruits such as spiky lychee and pungent durian. Bangkok is a great place to take a cooking class, where the whole family can learn to turn market finds into popular Thai dishes including pad Thai. At Kidzania in the Siam Paragon shopping center, kids enter a role-playing interactive mini-town and “work” in their chosen career path, whether that involves giving manicures at the beauty salon, landing planes at the airport, or singing it out on a live stage. Southeast Asia’s tropical islands offer excellent snorkeling opportunities, but in Bangkok, the best place for guaranteed sightings of colorful fish is Sea Life Bangkok Ocean World. Check out otters, penguins, and sharks, or head underwater as an aquanaut in one of the saltwater tanks. Check out ancient temples such as Wat Pho, home to a massive golden Buddha, then beat the heat by zipping around on coasters or waterslides at Dream World or Siam Park City. When you’re ready to escape Bangkok’s hustle and bustle, head out on a day trip to the popular seaside resorts town of Hua Hin (southeast) or Pattaya (southwest). Both beckon families with laid-back dining options, white sand beaches, and watersports just two hours from Bangkok. Spend the afternoon cruising through the ‘Venice of the East’ on this 2.5-hour Bangkok cruise. Watch as locals go about their daily routines and enjoy fresh local fruits and soft drinks as you travel past epic Thai scenery. Discover comedy that needs no translation at Nanta, a dynamic, non-verbal musical show that blends humor with traditional Korean samulnori percussion. Watch comic ‘chefs’ transform their kitchen into a stage with acrobatic cooking tricks, musical knives and a surprise dumpling challenge. Enjoy the nonstop rhythmic percussion and theatrical flair of a show that’s traveled across the world — keeping audiences laughing in Germany, Scotland, Japan and the United States. Board a longtail boat for a journey along the Chao Phraya River (River of Kings) and explore the canals of Bangkok. Your half-day tour includes cultural highlights of the Thai capital such as the majestic Grand Palace where you can view the Emerald Buddha at Wat Phra Kaew. You’ll also visit Wat Pho, a temple that houses the Reclining Buddha. Numbers are limited to 12 for a small-group experience. Tour Bangkok’s ‘khlongs’ or small canals and get a glimpse of local life. This guided excursion takes place aboard a longtail boat, giving you easy access to hard-to-reach sites such as the Artist’s House, a community center located within a restored wooden home. As your float down Bangkok’s backwaters, your onboard guide will fill you in on the city’s vast history and how it became the frenetic metropolis it is today. You can also extend your half-day trip with an optional guided tour of some of Bangkok’s most impressive temples.